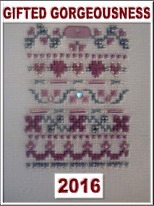 The free original cross stitch patterns listed here are small simple patterns, that can be completed with leftover floss. 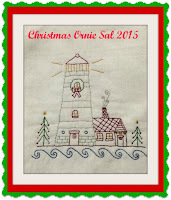 These cross stitch patterns are ideal for use as embellishments on clothing, pillowcases, napkins, greeting cards and holiday projects. I love to stitch ornaments for Halloween as well as Christmas! 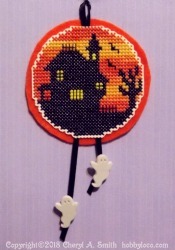 So I thought I would offer a simple free pattern can be made into a cute Halloween ornament. The finished design measures about 2-1/2" in diameter when stitched on 14ct aida. This pattern looks cute on a gift tag, greeting card or other small project, just as well as an ornament. I like to stitch on plastic canvas, as projects can be easily finished by adding a felt backing and then used for ornaments or added to holiday wreaths and other decorations. Click Here for pattern page. Please enjoy stitching these for your personal use - but do not sell these patterns, or post to any website, or include in any collection for sale without my permission. Click to view included content. 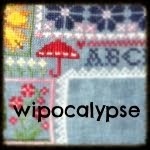 I have lots of WIPs (I am working on that!). I am stitching many of Sandy Orton's samplers (9 of them) including all of the 4 Seasons, as well as the Dutch Sampler, American Sampler, BeeHive Sampler, "To Everything A Season" Sampler, and Simple Blessings! *New members are always welcome. No obligation - drop by and post as you have time.